For the last four years, Tony Springall of Clevedon, Somerset, and Sue Andrews of Bildeston, have been researching and writing a history of Hadleigh during the 16th and 17th centuries. Many Hadleigh Society members will know of Sue’s extensive knowledge of the town’s history, from her work as Honorary Town Archivist and her lectures. Tony is a member of the Alabaster family, and whilst not a Hadleigh man, has developed an attachment to the town and visited many times, including the biennial family gatherings at the Old School. We recommend this new book to anyone with an interest in the history of the town. You will find it an enthralling read and those wanting to pursue the subject further will find extensive references to source materials. It takes a lively look at events, institutions, attitudes, religion and local politics through the eyes of one family, the Alabasters. From a variety of original documents held at Hadleigh Archive and other places, Tony and Sue not only reveal the exploits of this Hadleigh family but also many aspects of life in the town that have not been told before. First coming to Hadleigh in 1540, Thomas Alabaster soon established himself as a clothier in the important woollen-cloth industry. He joined the ranks of the elite as a town governor and administrator of the growing number of perpetual charities, many of which still function today, and together with three fellow townsmen, was responsible for purchasing the Guildhall for town use. His son, John became Hadleigh' s second mayor in 1619 and founder of the town's first elementary school in Bridge Street. Interspersed with Alabaster biographies are chapters giving background information. Religious conflict figures throughout the period, coming to a head in 1555 when Rowland Taylor was martyred. The aspirations of charitable benefactors; life in Hadleigh's almshouses; the manufacturing processes in the woollen-cloth industry; miscreants before the Dean and local justices; how the town coped in times of plague and the domestic scene are all explained. 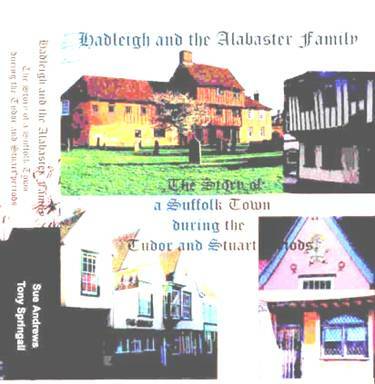 This self-published book has been produced with the assistance of Hadleigh Town Council, The Hadleigh Society, Friends of Hadleigh Guildhall, Hadleigh Charity Shop, John Bloomfield, Minstrel Productions, St Mary's Church and Babergh District Council. All profits will be donated to The Alabaster Society, a family history organisation, and Hadleigh Archive. There are black and white illustrations throughout the book including maps and family trees. It is available for £14.99 at The Idler, 37 High Street, Hadleigh or for £19.99 (including postage) from Sue Andrews, 17 Manor Road, Bildeston, Ipswich, Suffolk, IP7 7BG. At the April meeting Pip Wright gave a fresh insight into the treatment of witches. In England it was not a crime to be a witch until 1563. Things got worse when James I brought with him the Scottish tradition of burning witches. Much money could be made by those who claimed to be experts at identifying witches (lewdness and cursing was a good giveaway!) Local man Matthew Hopkins, Witch Finder General made his way around East Anglia during the Civil War but his success was brought to a halt when a few people were brave enough to say how effective he was in doing the devil's work. Altogether 100 women and 17 men were tried in this period in Suffolk, but there is only strong evidence that 20 were hanged. Around the county there were some strong pockets of accusers (including Copdock/ Chattisham/ Hintlesham, but not Hadleigh). There was much superstition associated with animals as ‘familiars’ and bodily features as signs of the devil. There were improbable tests like ‘swimming’ and weighing against the bible, and a judge with strong beliefs in biblical justification was more inclined to hang. In 1712 the last to be condemned by a jury lived long enough to be pardoned because the sympathetic judge delayed the hanging although she dared not return home for fear of reprisal. Nevertheless popular superstition lived on long after the law was repealed, and maybe still to this day. If not quite witches, we can find many modern parallels of people hounded by popular superstition. On Monday 23rd May Sue Andrews will take us on an (unfortunately) imaginary tour of the town’s pubs of yesteryear. As usual, in the Old Town Hall at 8pm. Don’t forget to find our tent at the Hadleigh Show on May 21st. With deep regret we have to announce that Joe Byrne died on 12th April. He was a stalwart of the Society for many years and it was his practical drive, ingenuity and attention to detail that ensured the success of so many projects. He pioneered the computerisation of the Archives, prepared many a May Show display and tirelessly probed the weaknesses of Tesco planning applications. He will be sorely missed and our thoughts at this time are with Jan and their family.